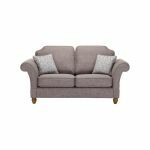 The Dorchester 2 seater sofa in Civic Smoke with Silver Scatters promises to bring style and cosiness into your living room. Featuring plump-free fabric seat cushions and complementary scatter cushions, the sofa also has a fibre back for great shape retention, ensuring it can be enjoyed in your home for years to come. The compact yet cosy design makes it a great solution for small spaces, or as additional seating in a large layout. Constructed with solid hardwood in the frame, this durable sofa is part of the classic Dorchester collection and features scroll arms and real oak feet that will add charm and character to any space. Browse the complete Dorchester range to discover footstools, armchairs, and larger sofas to complete your perfect living room.